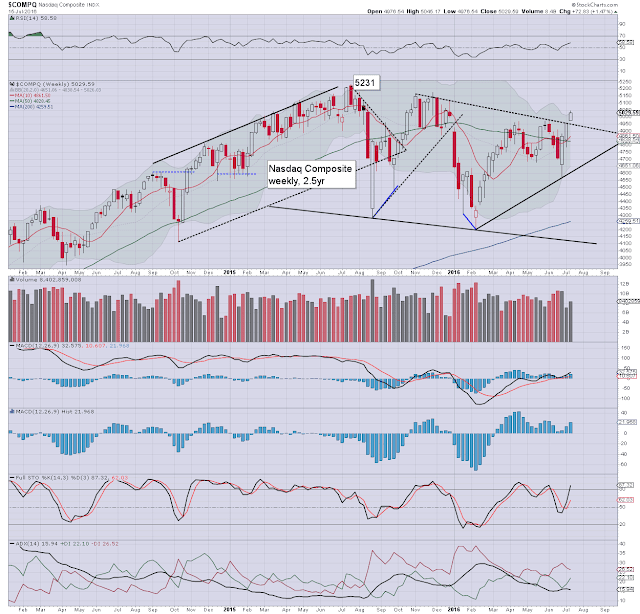 US equities continued to climb from their BREXIT lows, with net weekly gains ranging from 3.9% (Trans), 2.0% (Dow), to 1.5% (sp'500, Nasdaq comp'). Near term outlook offers cooling to test the breakout level of sp'2134, with a moderate threat of the 2105/2095 zone. 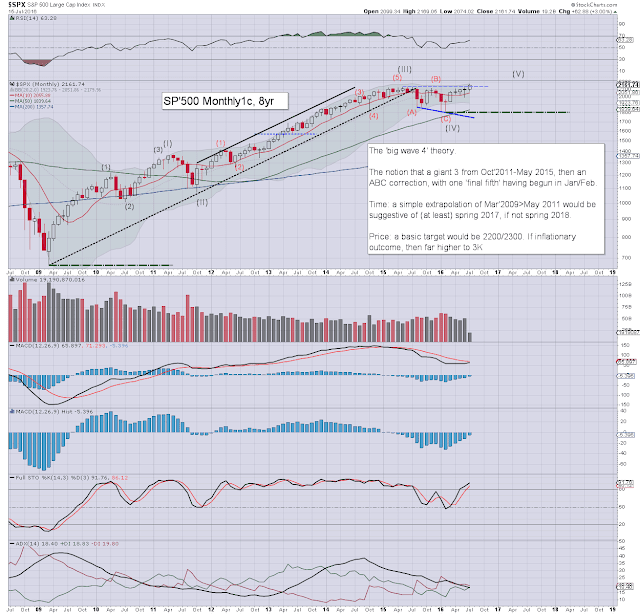 Mid term upside to the 2200s looks extremely likely by late Aug/September. 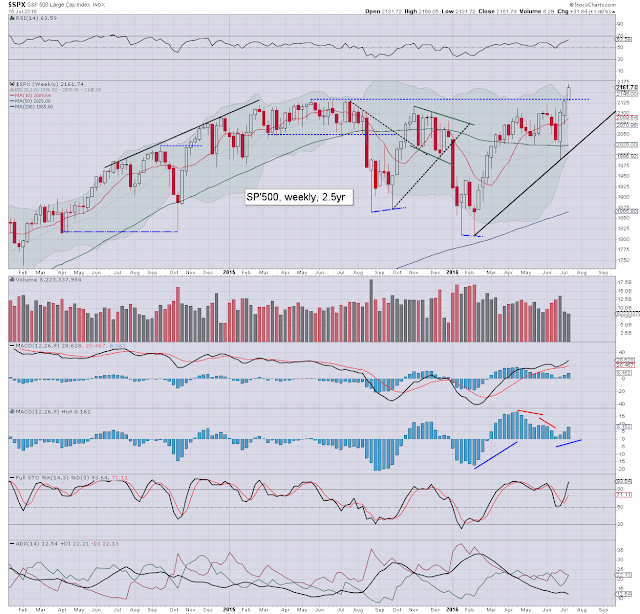 The sp'500 has swung from 1991 to 2169 - gain of 178pts (8.9%). On any basis, this is a very powerful upward swing, and considering the breakout to a new historic high, it bodes for broader upside across the summer and into September. Underlying MACD (blue bar histogram) ticked higher for a third week. 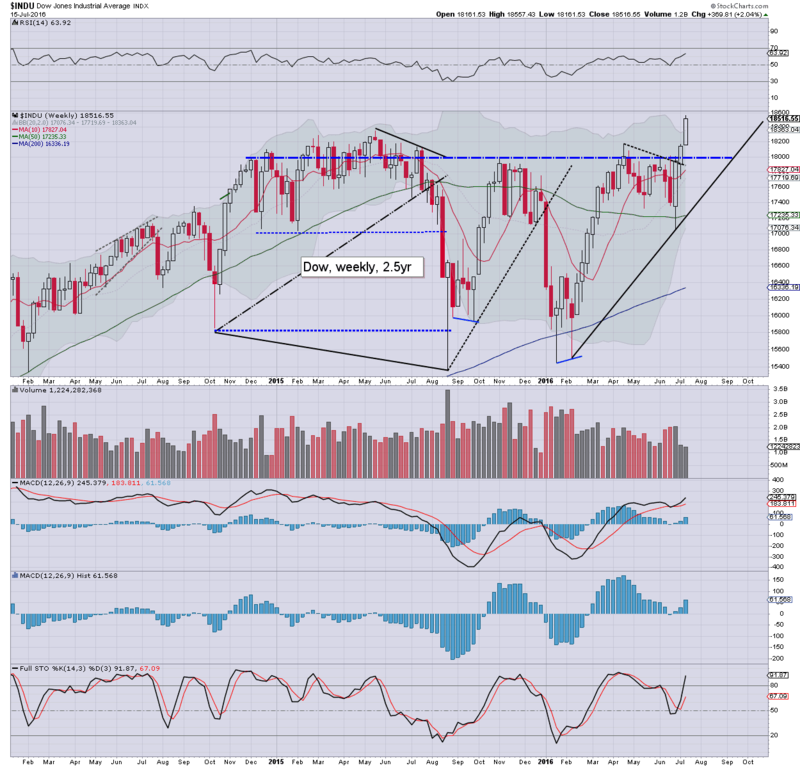 Best guess: a moderate retrace/cooling ahead of the next FOMC, to at least the 2130s, possibly 2105/2095 zone. A July close above the key 10MA (2055) looks extremely likely. Unless equity bears can break back under rising trend - which by end August will be around 2070, there is zero reason to be bearish. 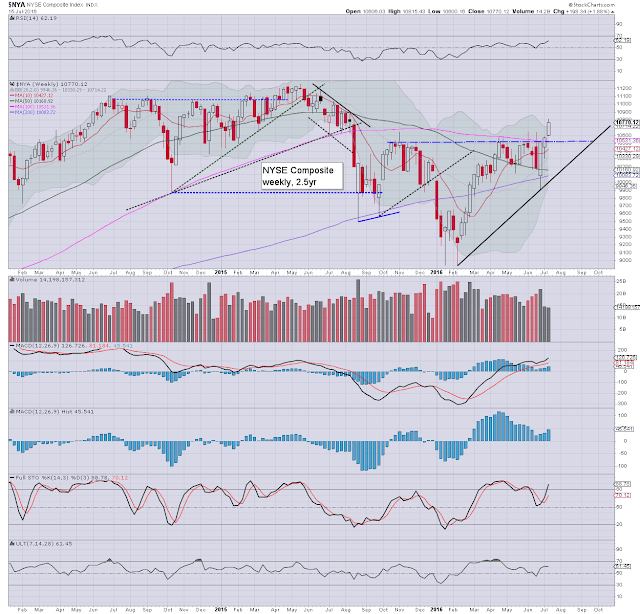 The Nasdaq gained 72pts (1.5%), settling the week above the giant psy' level of 5K. There is a clear break above descending resistance, with prices already brushing the upper weekly bollinger. Next key levels are 5150, and then the historic high of 5231. 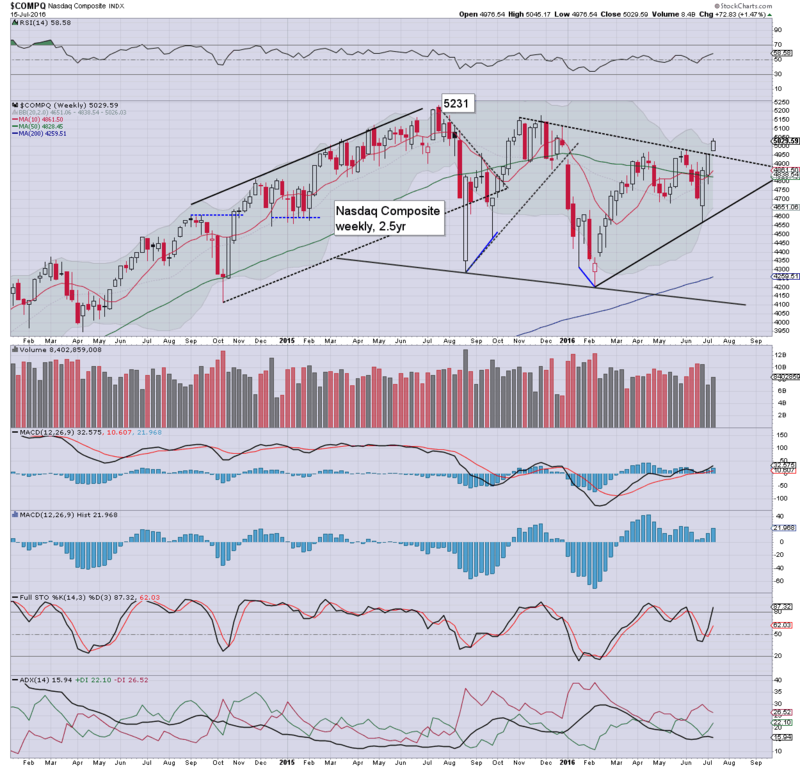 Considering the sp'500/Dow, the Nasdaq looks set for the 5300s by late September. Talk of 6K by end year can now begin. The mighty Dow saw a net weekly gain of 369pts (2.0%), decisively breaking the May'2015 high of 18351, with a Friday morning high of 18557. 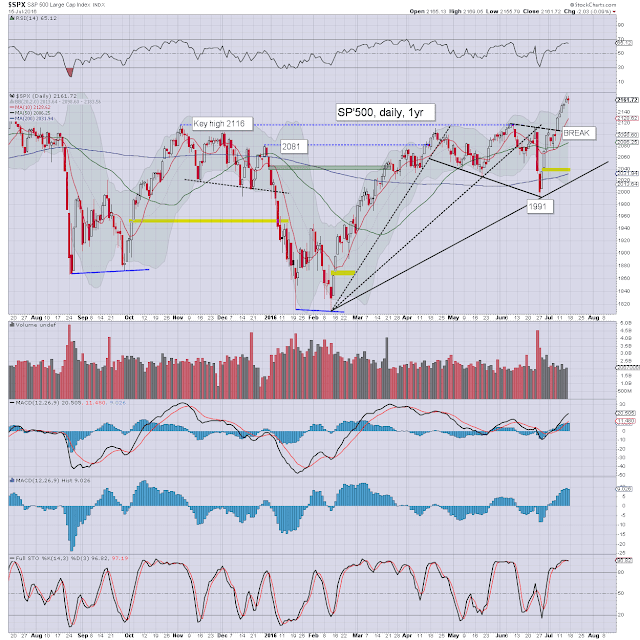 Next resistance are the 18600/700s, and then the psy' level of 19K. 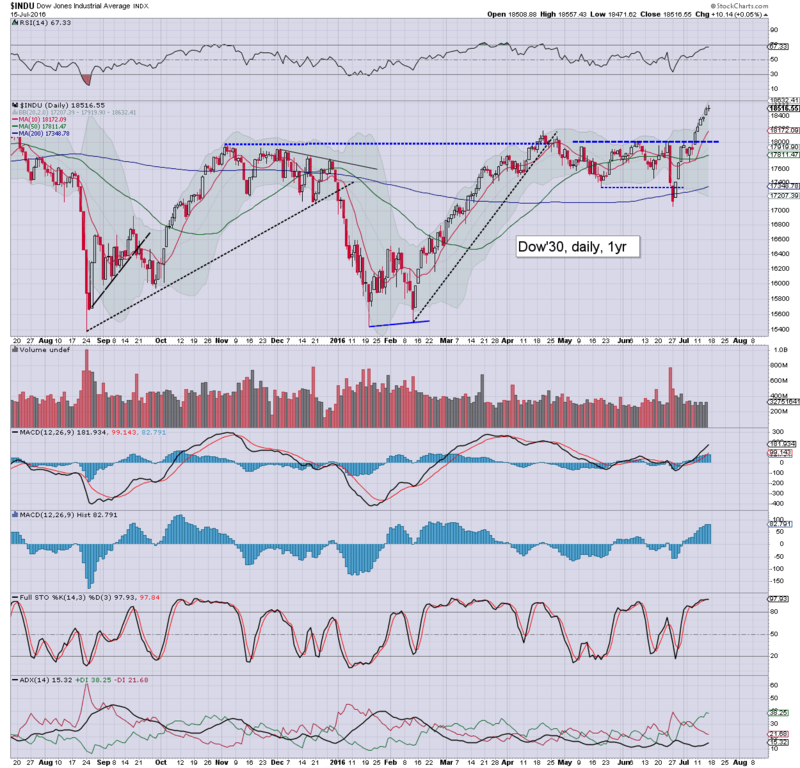 Any price action in the 19000s should then offer a straight run to the giant 20K threshold. 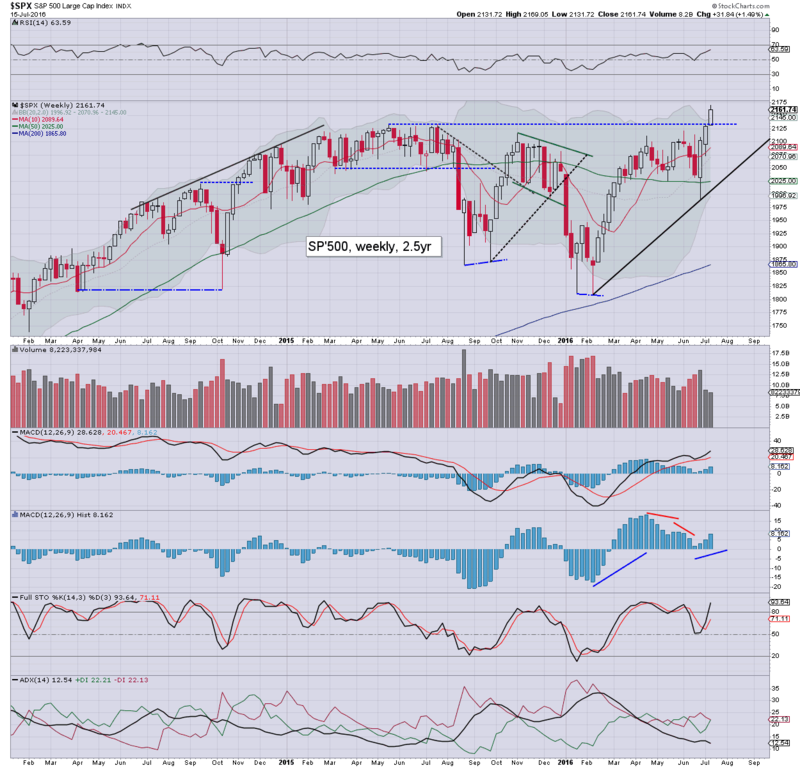 The master index saw a net weekly gain of 1.9%, settling @ 10773. 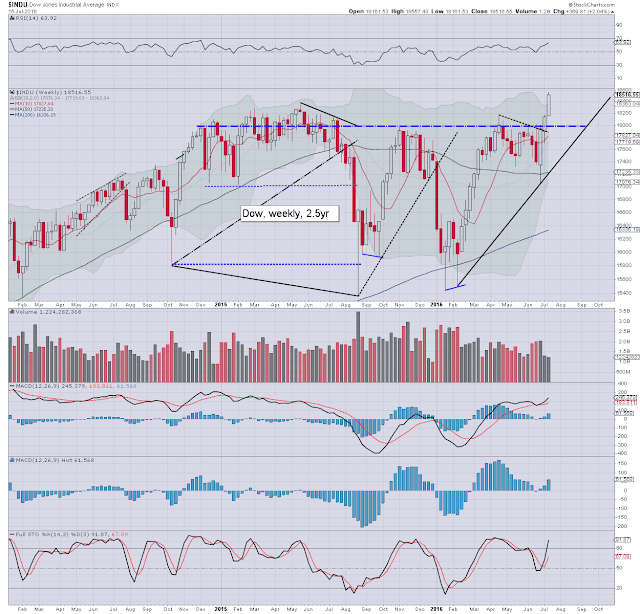 Next upside targets are the 11k threshold, and then the 2015 high of 11254. The second market leader - R2K, settled +2.5% at 1205. The door is now open to challenge the June 2015 high of 1296. Mainstream talk of the 1300/1400s is already starting to appear. 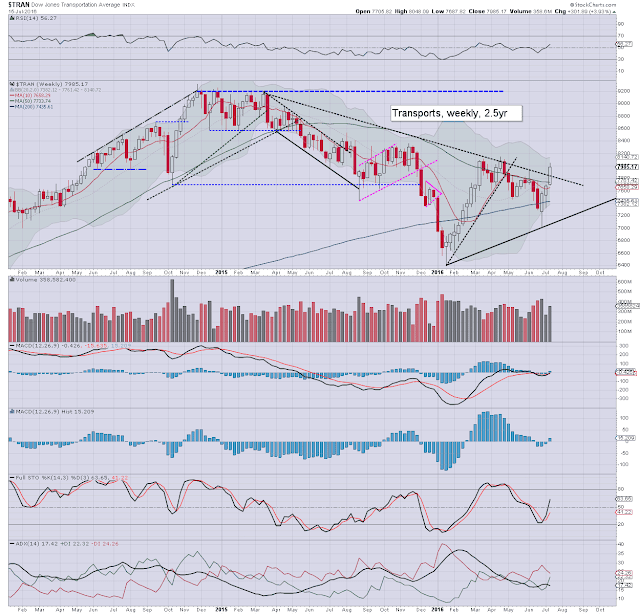 The 'old leader' - Trans, continued to power higher, with a net gain of 3.9%, settling at 7985. Despite not closing above 8K, there was a notable Thursday high of 8048 - the best level since late April. 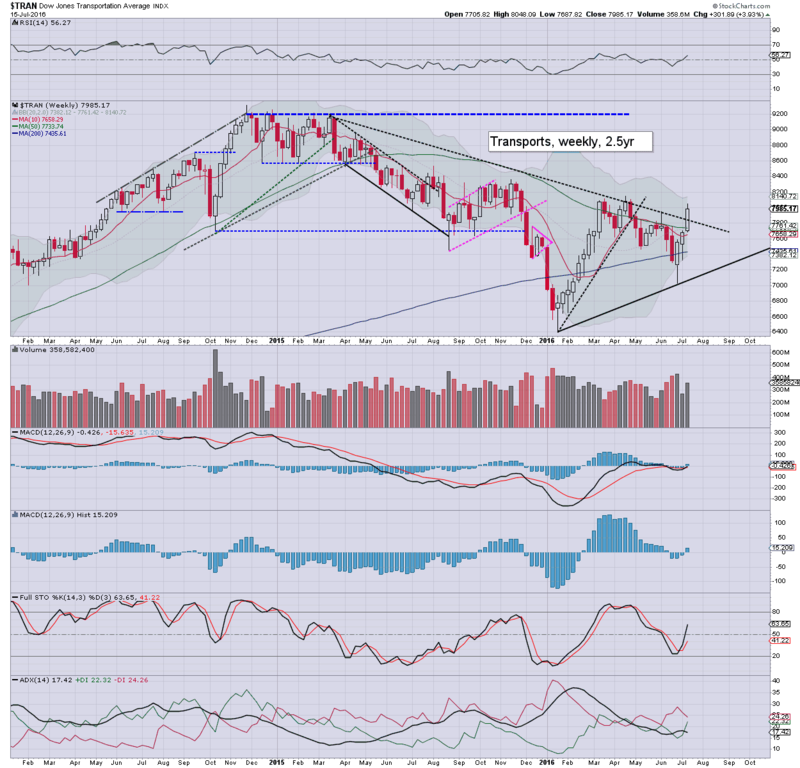 There will be considerable resistance around 8600. After that... the Nov'2014 high of 9310, but that remains a very considerable 16.6% higher. 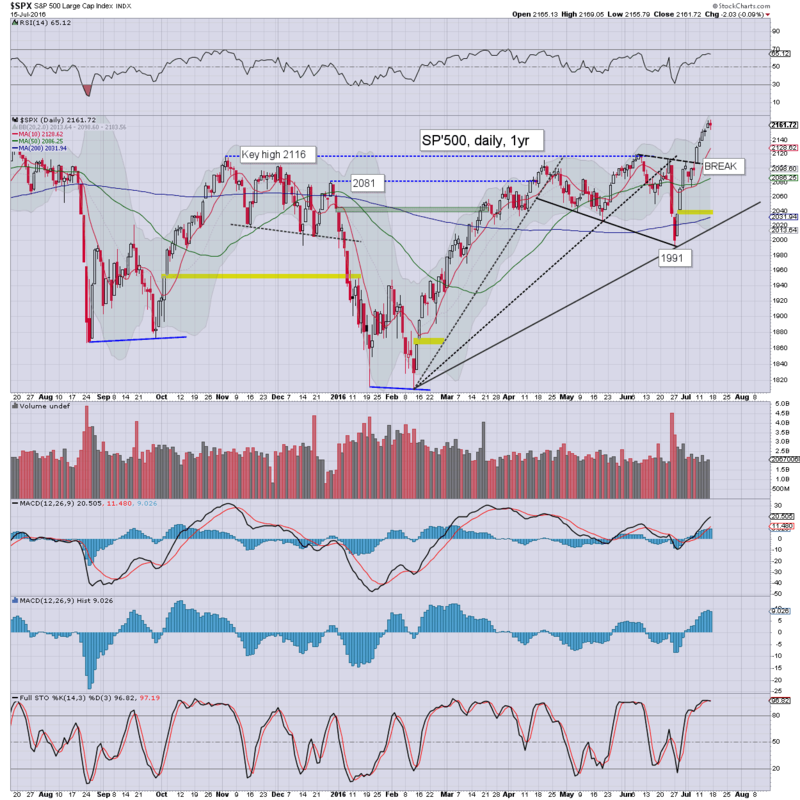 A third week of significant upside, lead by the sp'500, and followed by the Dow. 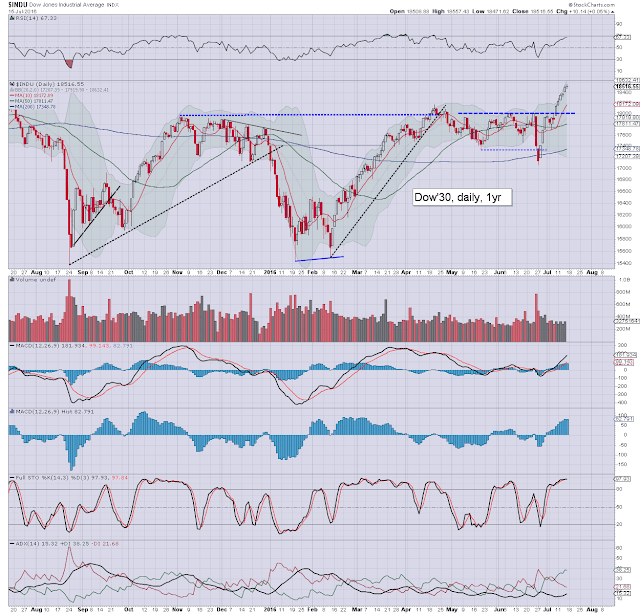 With new historic highs for the sp'500 and Dow, the Nasdaq looks set to follow (>5231) in Aug/Sept. Some near term cooling ahead of the next FOMC is probable, but with July set for significant net gains. Regular readers will be well aware I have a somewhat cynical view of Elliott wave theory, not least as its arguably inflexible and dismissive of sporadic news events. Effectively, wave'4 was an ABC sideways correction spanning 9-10 months, with a fifth wave having begun in Jan/Feb. How high and for how long? There are a fair few scenarios, and I'll detail this issue in more depth another time. Suffice to say, I'm resigned to mid term upside to the sp'2300/500s into next spring. There are a truckload of corp' earnings, but in terms of econ-data.. there isn't much. The ECB will meet/announce on Thursday, and the market will be looking for some provisional idea about a new bank support program, particularly for the Italians. *no fed officials, as its the blackout period until the next FOMC announcement of July 27th. *the next post on this page will appear Monday at 7pm EST. It was a third consecutive week for the equity bulls, with the sp'500 net higher by 31pts (1.5%), settling at 2161, with a new historic high of 2169. The Dow saw a net gain of 369pts (2.0%), settling at 18516, having seen a new high of 18557. Unquestionably.... bullish. It was just another day for the equity bulls, with a pair of new historic highs in the early morning, and then some rather natural weak chop into the opex-weekend. The next 8 trading days - into the FOMC of July 27th, threaten some slight cooling. 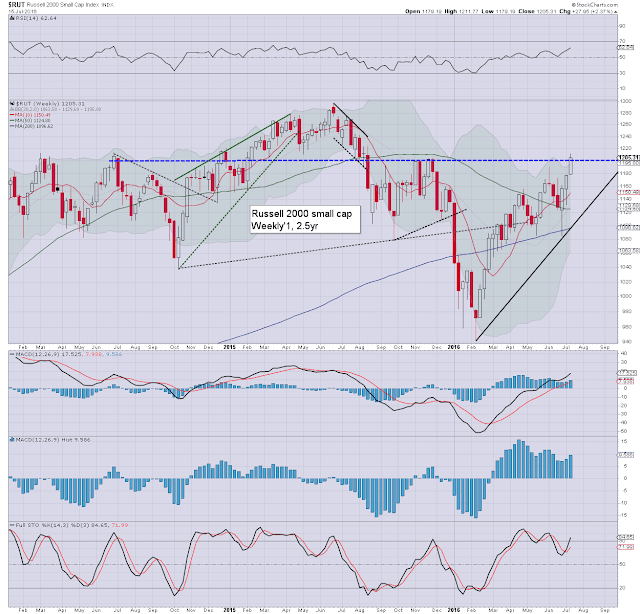 Certainly, the 2130s look probable, but a test of the 2100 threshold won't be easy. Thanks for the messages/emails, it makes the week far more interesting!